Getting out the musty, mildew smell of towels isn’t as hard as you think. Years ago I was given this recipe, and it has been my go-to ever since. Living in the Pacific Northwest, there are plenty of water moments. There are lakes, streams, and the Puget Sound. Summer time is full of water fun, but it is also full of smelly towels. 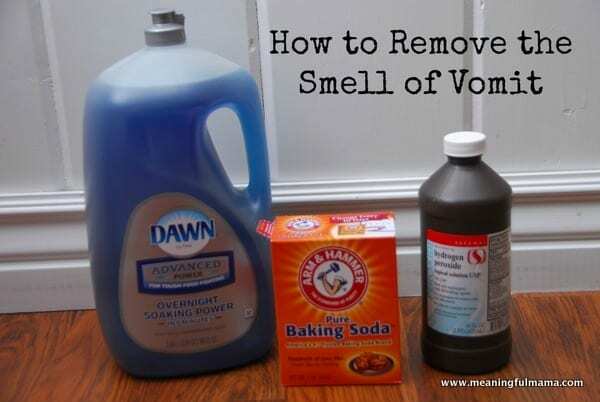 Another popular and super effective smell recipe on my site is the recipe for removing the smell of vomit. Between these two recipes, many of your odor needs will be eliminated. Part of being a mom or a dad is taking care of the house and the never-ending laundry. I have many laundry hacks, which is part of why laundry is my favorite chore. Mildew is a stubborn smell. It is often hard to remove the nasty smell even if you wash your towels over and over again. I think we’ve all had towels that get that mildew, musty smell – especially with kids when you find towels in piles. We are still working on hanging up towels rather than throwing them in a pile. Hopefully that habit can be fixed, but in the mean time, I give you a recipe for getting out the musty, mildew smell of towels. Step 1: Put 1-2 cups vinegar in with your towels. Wash the towels on the hottest setting. Do not dry them. You’re not done yet. Step 2: Next, add 1/2 cup Borax to your regular detergent. Wash again on the hottest setting. Step 3: Finally, dry your towels on the hottest setting. I don’t generally use fabric softener sheets because I’m not convinced they are the healthiest option for us because of the potential risks of the chemicals found in softener sheets. However, I do use them for the occasional towel treatment. 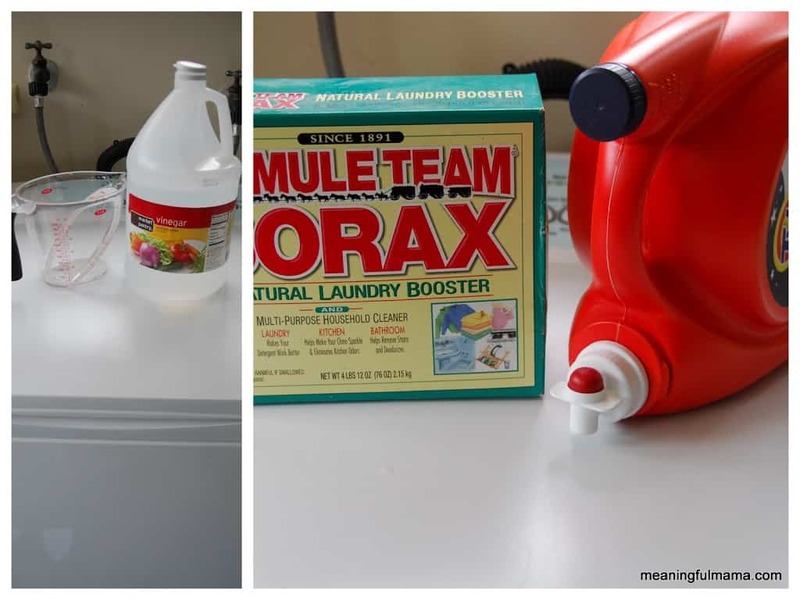 Borax may not be the best option on a regular basis, but I have found that this solution really does work, so I have decided that every once in a while using these more powerful cleaners will be tolerated. This post was originally published in 2012, but it has been updated and republished in 2018. I’m glad it will be helpful! Nothing worse than getting all fresh smelling yourself and drying off with a less-than-fresh-smelling towel. Thanks. I’ve got the makings for all-natural detergent (including Borax) so this will be great. Woot! WOot! Congrats! Your post was my #4 most clicked post in the Mommy Club this past week! i can’t wait to try your mommy solution in my own home! I can’t stand musty summer towels!! Thanks for sharing and stop on over and see your feature. I can’t wait to see what you share this week! Thanks, too, for adding my button to your post. You rock! Great tip. Thanks so much for weighing in! My tip to get any smell out of musty towels, vomit, “That old greasy dish cloth smell ” is just add 1/4- or a tad more depending on the load size, And the smell & any detergent you prefer, is arm & hammer pure baking soda detergent of your choice now, wash on HOTTEST SETTING and use fabric softener or not your preference.. This works every time, cuts down on the cost, plus the water usage. Only need to wash and rinse one time…. fresh as a daisy every time!! However your tip was great also. Thanks so much. I’ll have to try that to see if it is comparable. So far, nothing I have found works as well, but if I can cut on costs and time it’s definitely worth a try. Thanks for adding this to the conversation. In my experience, yes. It’s how I always do my towels when they reach that awful point. I have not tried Borax in the wash before so I will have to try. But my go to that I use for every load is to use the Distilled White Vinegar in the rinse cycle. It seems to remove any left over soap residue and leaves clothes a bit softer like fabric softener. This way I am only doing one wash. Especially since my machine’s normal cycle is an hour long! Great tip. Thanks so much! Let me know what you think of the Borax too.